The article on Brighton shop fronts published earlier in the year, made me look at my family bits and pieces as my Granddad’s garage at Patcham was mentioned. Granddad, also known as Pop, and my Dad, young George, bought the small triangle of land at the north end of the bypass, with money saved by Pop and from a small legacy my Dad had been left from an old boss when he was a chauffeur. They started the garage around 1929 and owned it until 1952. It was a petrol station, mechanical engineers and an engineering works. 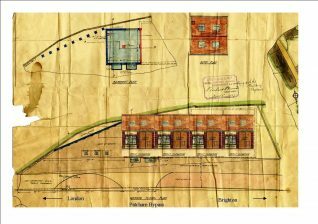 The plans show how it could have looked, with the old Co-op dairy building next door they purchased later, it would have been quite an impressive site but alas the war stopped the development. 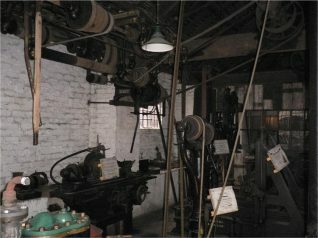 During the war there were twelve to fourteen girls working on the engineering machines. Most of the people who lived locally to the garage would know him by his shiny trousers and the fact that he never wore socks. If you looked at his trousers you could see the shine where he wiped his greasy hands on them. I can remember that when he went to bed his trousers would near enough stand up on their own. The garage had four pumps selling ROP (Russian Oil Products) Regent, Redline, and Anglo-American (now Esso) fuels. 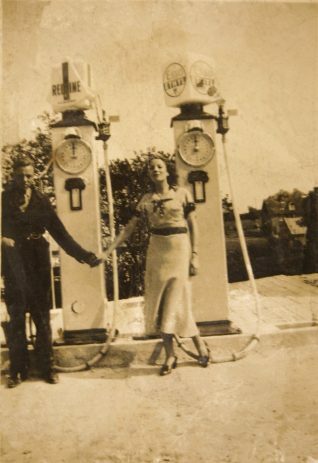 During the war these were commandeered by the National Fire Service for use by the Brighton fire brigade The photo shows two of the old style pumps and young George with his sister Stella c1936. While developing the garage and living in Mackie Avenue, Granddad and Dad were also working on an ‘Eye Magnet’. This was a electromagnetic device for use to remove iron filings from eyes. 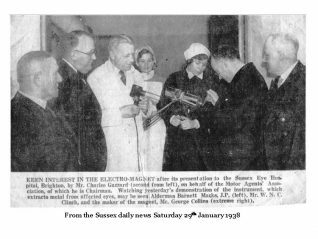 When it was finished he donated it to the Sussex Eye Hospital and the photo here shows him demonstrating it at the presentation. With the earlier pumps, your oil would be hand pumped into tin jugs to be put in your engine. Later on we used bottles that we filled ourselves. 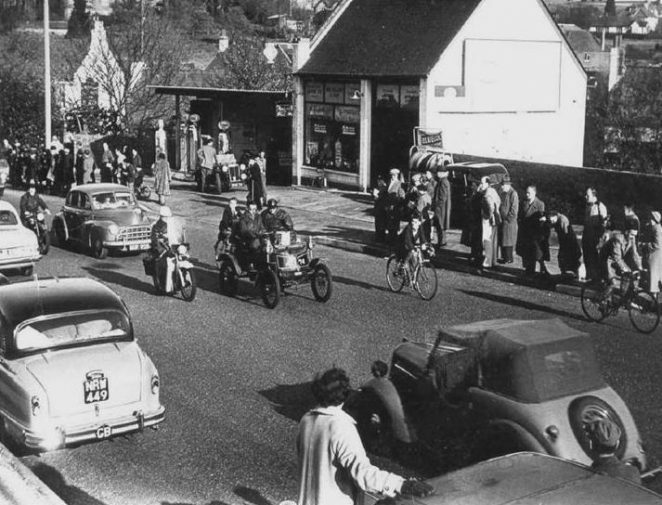 In the early 50s it was one of the first petrol stations to go Solus Esso. In the later photo c1951 you will see that all the pumps are now serving Esso and the forecourt has gained a canopy. The business was sold when Pop retired. In 1952, I remember sitting in Genevieve when it was parked on Pop’s forecourt, and pressing its long, rubber, dragon-shaped horn. Genevieve was the veteran car and star of the film of that name. When my dad used to fill up at the garage, there would be a sign on the wall saying, “When filling, no smoking, stop engine, brake wheels”. I could never understand why you had to brake the wheels. By the way, the article shows a lovely photo of my Mum, Stella, and her brother, my dear uncle George. She would have been about 21 then. Pop lived with us for a while. Smoked roll-ups all his life. Drank his tea from his saucer to cool it down. Gave me piano lessons.